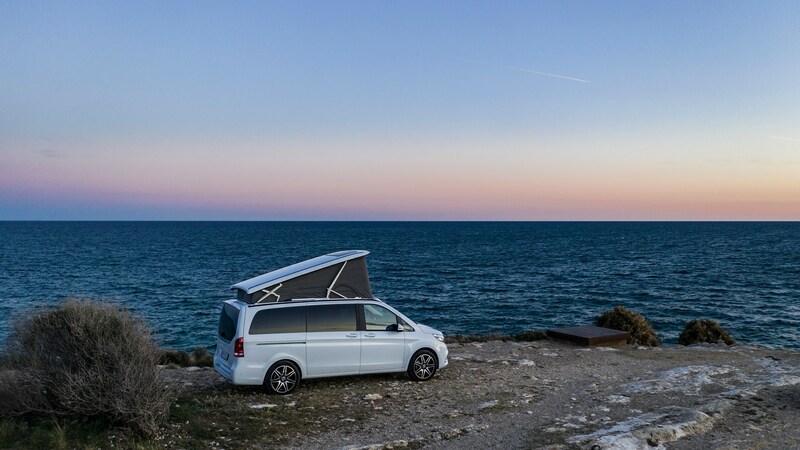 Until 2017 Volkswagen had the OEM glampervan market all to itself in the UK with its long-running California, but that year saw Mercedes-Benz finally come around to offering its V-Class Marco Polo to well-heeled outdoorsy types. Since then, the allure of the three-pointed star has ensured a small-but-lucrative trickle of customers has plumped for one Merc’s compact motorhomes, with its appeal broadened further by the arrival of the less-costly Horizon version, sans fitted kitchen and other niceties. For 2019 there’s bigger news that will make it even more tempting: a facelift complete with a mechanical overhaul. A facelift? The Marco Polo looks like it did before! Indeed. This is one of the mildest facelifts in automotive history – think of it more as though the Marco Polo’s been using anti-wrinkle cream rather than going under the surgeon’s knife. There are differences, though, but admittedly they’re unlikely to catch the eye of anyone but a Benz-spotter. Sport models have a much larger lower grille in the front bumper, while the sportier (yes, sportier than Sport itself) AMG Line has chrome-look pins on its spangly new grille. Other Mercs have sported (sorry) this look for a while, so in essence it’s merely bringing the Marco Polo – and its V-Class MPV sibling – into line. You can also spec intelligent-beam LED headlamps for the first time on this model, which cut-out the brighter light to avoid getting on the wick of other road users. Depending on how much you spend on extras there are some new colours and different alloy wheel designs. Presumably the old-fashioned dashboard’s been ousted then? Err… How to put it? 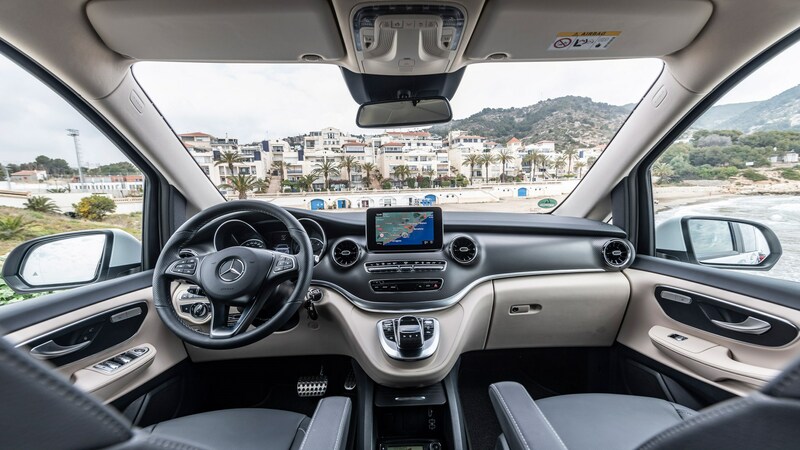 If you’re expecting a slick dual-screen set-up as per the A-Class then prepare for disappointment. At first glance everything looks pretty much as it did before. As with the outside, there are a handful of differences, including turbine-style airvents as per the E-Class, different trim appliques for the dashboard and door panels and… That’s about your lots. Prices have yet to be confirmed for UK-market Marco Polos, but options will include an upgraded central multimedia screen and a second screen within the instrument binnacle to replace the conventional gauges – it’s a similar arrangement to the facelifted C-Class where it works well. We shall and rejoice, for starting-up a Marco Polo no longer sounds like you’re cranking an old Routemaster London bus into life on a cold Monday morning. Gone is the venerable old 2.1-litre gruffmatic noisily going about its business – instead is the well-regarded 1950cc OM654 diesel that’s gradually being introduced across Mercedes’ car range. Two versions are offered for British buyers: the 161bhp V220d and the punchier 236bhp V300d – we’re not getting the 187bhp V250d that the rest of Europe will be offered. If you’ve driven an earlier Marco Polo then you’ll be immediately struck by how quiet the new motor is – we’ve sampled the V300d so far and were struck by the refinement both at cruising speeds and under hard acceleration. Despite producing 500Nm of torque from 1600rpm its urgency is very easy to modulate, making it a doddle to ease slowly around town – or camp sites – yet briskly get up to motorway speeds. Mercedes quotes its 0-62mph time at 8.6 seconds, that’s eight-tenths slower than a V300d without the Marco Polo’s kitchen paraphernalia and pop-up roof. Aiding the hushed progress is Merc’s 9G-Tronic automatic transmission, which replaces the older seven-speeder. For the most part its satisfyingly slick, progressing through its ratios without a hint of transmission shunt, but on occasion in its quest for the most fuel efficient cog it will swap about for the briefest of moments while you make your mind up about how hard you’re pressing your right foot down. Right-hand drive Marco Polos remain rear-wheel drive, with no 4Matic option for the UK. How easy is the Marco Polo to drive? More good news: even if you’ve not driven something this size before, there’s little to be daunted about. The controls are light, all-round visibility is excellent – even without speccing the 360-degree camera system – and you’re sat high with a commanding view of the road ahead, over the top of many SUVs, in fact. What it’s not is exciting to chuck about through a series of sweeping bends. Doing so with cupboards full of crockery isn’t wise anyway, but while it has sufficient traction to maintain tight lines through corners, you’re away of its desire to lean over as you do so. It’s not like a listing ship, but inevitably a body so large with an enormous hole in the roof will flex a bit. Pilot the Marco Polo with care and it’ll present few vices. And as a home from home? At the Marco Polo’s business end, it’s a case of as you were, which I no bad thing in most respects. Sure, it’s a tad snug for four, and if you spec the optional fifth seat you’ll need to find somewhere to store it before you convert the rear bench into a bed, but the built-in units, blinds and fold-out table all feel of good quality. 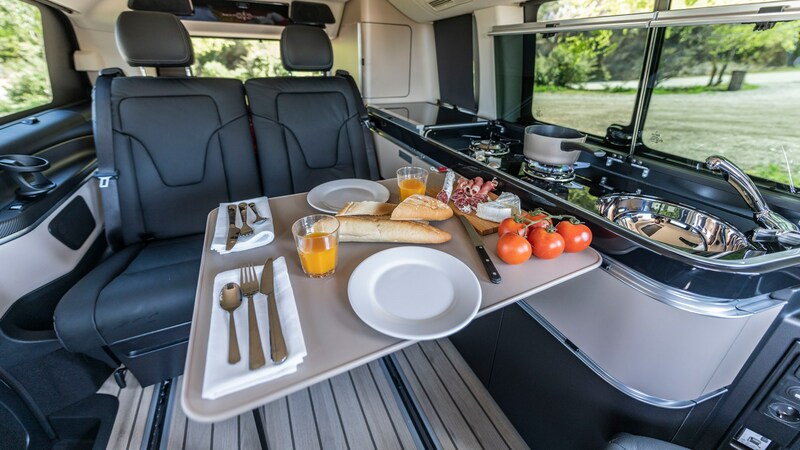 It’s all the work of Westfalia, a firm that’s been in the camper van conversion business (whispers, starting with VWs) for over four decades, so it should be decent. Nit-picking? While the roof mechanism is slick, the aftermarket control module slotted into the lower reaches of the dash is bizarrely cheap in look and feel. Also, there’s no vanity blind to cover the roof gubbins about the front occupants’ heads as you’ll find in Volkswagen’s California. Remember that like the California, the Marco Polo’s sole access door to the rear compartment – as well as its awning – are located on the right-hand side of the vehicle. Not ideal, but there’s no factory option to have them swapped over. 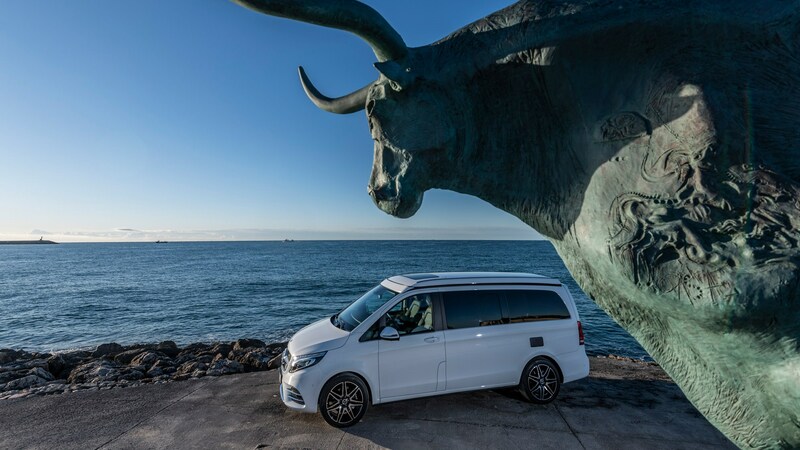 You could live with a V-Class Marco Polo as your daily driver, but doing so would be a compromise, as you’d be constantly hauling around a lot of kit that you’ll likely only use a few weekends a year at most. It’s an expensive toy in those instances. 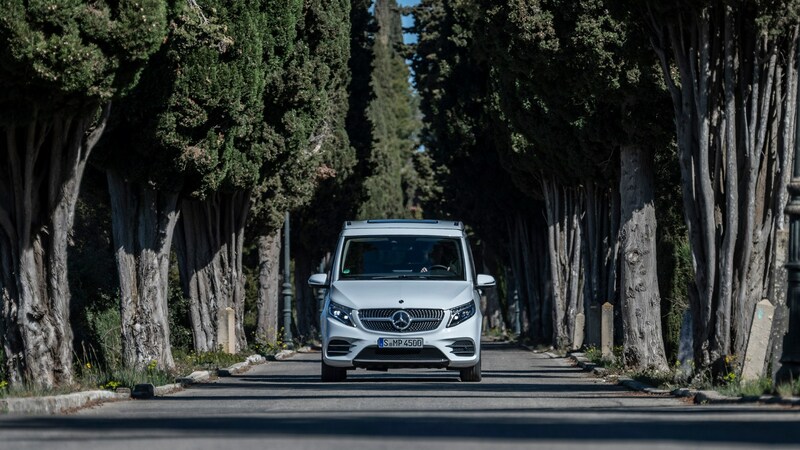 Where the Mercedes makes the most sense is if you’re going to be taking it to various corners of the country or wider continent with great regularity, combining much of the freedom of camping with a degree of hotel-like comfort. So, this or a California? Both do a great job, but the Mercedes feels that little bit more upmarket and isn’t bound by the Dub Scene like the VW is – by comparison, the Marco Polo’s a virtue of discretion and perhaps the better for it.